Saturday night is opera night. And we made our way to the Deutsche Oper (somehow, its all the Deutsche Oper this year) through crowds of Cup-Final footballing folk … red-and-white for Bayern Munich, black-and-yellow, Borussia Dortmund. The opera this day was Tosca, which was the very first opera I ever saw – circa 1959 – in Nelson, New Zealand, with piano only, and starring Betty Helawell, Graham Gorton and I forget the tenor. Tosca is an opera where, imperatively, the three central characters need to be magnetic and superb, but this touring staging was All Right, and it fixed me on the path I was to follow. Well, things didn’t turn out quite as billed. None of the three originally-slated stars were there on the night. Happily, the grand, unfussy designs and simple, intelligent (mostly) direction were. Another splendid, older (1969; dir: Boleslaw Bartog) Deutsche Oper staging become a classic. Three in a row! The performers may not have been precisely the magnetic trio of my dreams, but they did wonders with minimal rehearsal, especially tenor Stefano La Colla, a replacement for a replacement, who had flown in from Pisa just hours since, and who apparently played the role after just a talk-through in a taxi. But even had we not been told that (by a jolly man-before-the-curtain), even if we took Sig La Colla’s performance at face value, he was a simply marvellous Cavaradossi. I won’t forget this tenor in a hurry. As a true, Italian verismo performance, singing and acting, he was superb. The Deutsche Oper should kidnap him, and stop him going back to Pisa. The clear, ringing voice, slicing effortlessly over the rich and robust orchestra (that man Repusic again!) was a thing of beauty and stylishness. It was my ideal of a true Italianate tenor performance. Not starry, not showy, just grand, grand, grand and so convincing. I long to hear him again. I don’t care if it’s without a rehearsal! The other two players had a task on hand to keep the triangle even, and I’ve got to say they didn’t quite succeed. Anna Pirozzi was the Monastyrska replacement as Tosca, and she started indifferently. In act I she looked good and acted nicely, but alas her voice seemed underpowered. Nervous? Well, you couldn't blame her! But, only beyond the stave did she really rise above the accompaniment. Act II was altogether better – the ‘Vissi d’arte’ was very sweetly sung, and not at all like an excisable showpiece – and her dramatics were well regulated in a fine acting performance, which came to a peak in the final act where she inter-acted marvellously with her never-seen-before lover. Thomas J Mayer was Scarpia. I think this is the best role in the show. AND he gets to go home after Act 2. 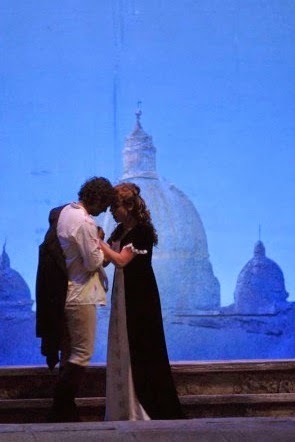 His ‘Va, Tosca’ which brings Act I to a climax is my favourite moment in the opera. Herr Mayer looked superb -- tall, handsome, nicely lecherous – but he, too, had a sticky first act. His voice was sticking on his soft palate. Woofly and deadened. It didn’t soar. And, oh! will opera singers STOP falling on their knees. People DON’T DO THAT. It’s soo stagey. Anyway, the ‘Va, Tosca’ which should soar viciously above the church music didn’t, and the melodramatics merely distracted. My ‘favourite moment’ was a bit of a disappointment. Act II was much better, his voice became clearer, the melodramatics limited, and the stand-off, between him and Tosca, was musically and dramatically wholly satisfactory. The smaller roles were splendidly sung, if sometimes curiously directed. Seth Carico, who has the priceless knack of making a supporting role seem interesting and important, was a richly sung, non-buffo, youngish Sacristan. I like it played like that. Although I’m not sure I agree with dressing and directing him like Fagin in Oliver. When he was surrounded by tripping (arghh) choirboys, I half expected them all to burst into ‘Consider Yourself at Home’. 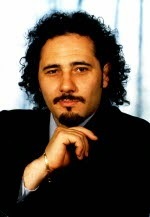 Jörg Schörner, ideal and superb casting as Spoletta, suffered somewhat similarly. Bit of wicked-witch acting there. A cross between Uriah Heap and Quasimodo. With a bit of Faginesque rubbing of the hands! Director? Cut that. It’s a bad laugh, especially at that moment. And get him to stand up straight! Bent isn’t menacing. He looks like the hunchback from Tanz der Vampire. Another bad laugh. Noel Bouley sang and acted Angelotti most convincingly, but what happened to his limp between his first exhausted appearance and his second? (Limps were in fashion, the Sacristan had one too!). I’m not sure about casting the role so young, though: Angelotti (around whom the whole tale turns) is supposed to have been Consul of Rome, isn’t he? The chorus has little to do in Tosca. They sang their ‘Te Deum’ perfectly, provided occasional stage scenery and pictures, and there were only very few fiddly bit of business to distract from the principals and their story. Tripping choirboys … yecccch. The orchestra had a field day, and were wonderfully lush and Puccini-esque. All in all, a grand-looking, competently-played Tosca, with one shining performance. However, I’m not sure that one shining performance is ideally what this opera needs … I prefer the triangle. Afterwards, some disappointed but charming young Dortmund supporters (0-2) looked after me on the midnight train to Nordbahnhof … rah! Borussia Dortmund!!! I’m now a fan. Rah! Puccini! I’ve been a fan for half a century..
Post scriptum: My friend Helen reminds me that the New Zealand Cavaradossi was Jon Andrew. I shouldn't have forgotten him.